Our group arose early this morning in Istanbul in order to make our flight to Izmir. Izmir is a beautiful city on the Aegean coast of Asia Minor about 35 miles north of Ephesus. It is known as the location of the Biblical city of Smyrna. Smyrna is mentioned only twice in the New Testament as the location of one of the seven churches addressed in the Book of Revelation (1:11; 2:8-11). The earliest city of Smyrna was founded in the first half of the third millennium B.C. at Bayrakli, a few miles from the present city of Izmir. In 600 B.C. the city was captured and utterly destroyed by King Alyattes of Lydia. During the 5th and 4th centuries B.C. the city was insignificant. All of this changed after the time of Alexander the Great when a new city was founded on the slopes of Mount Pagos. Our visit today included Mount Pagos. From there we had a magnificent view of the city and the harbor. We also visited the Roman Agora, and two archaeological museums. 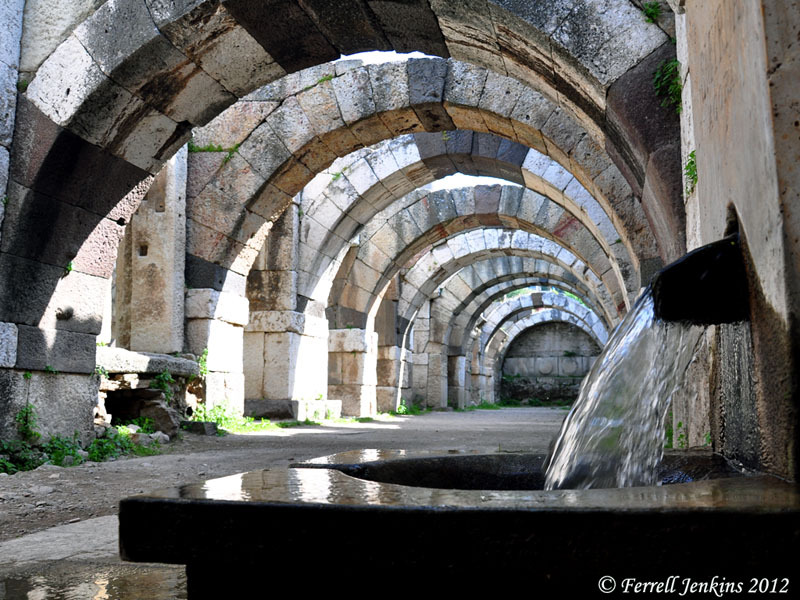 This photo shows the great arches in the lower level of the three story civic agora dating to the second century A.D., and a powerful spring of water that was discovered only a few years ago. Lower level of the agora of Smyrna and a powerful spring. Photo by Ferrell Jenkins.